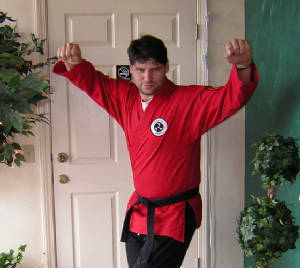 Our Chief Instructor is Sensei Chris Kimsey Taishi/Sandan. Sensei Kimsey a Student of Renshi Al Martin Jr.. Kimsey Sensei has shown indomitable spirit despite certain limitations and Dissabilities. As Chris Kimsey, Sensei recounts, "The first time I met Al Martin Jr., Sensei was in a restaurant I used to go to after work”. The owner, who knew I was a martial arts instructor, pointed out a short little man sitting by himself in a booth he said that fellow over there knows real karate, “A Special Old Style of Karate” he told me how he himself used to train with Al’s father who had been stationed in Okinawa during WWII. I went over to speak with him (Al Martin JR.), to get to know him, but I could feel the Sensei's powerful aura holding me off. When he looked at me his eyes were hauntingly brown and piercing like daggers, and I could barely mumble my name under the intensity of his stare. He ignored me that night, but I kept after him…I found out where he lived and used to drive by his house at least once a day… I gathered my courage after a few weeks then I packed a bag and camped out in his front yard under “Ironically” a pine tree for a whole week, luckily he didn’t call the police to me. Eventually, little by little, he got used to me (or tired of me) hanging around and finally came out to talk to me. After this I would show him what I knew, which I thought was pretty good Karate, but he'd just shake his head and tell me I was only a beginner. He'd say, 'you know this?' then do a little move, which of course I didn't know, then look at me laying on the ground and shake his head again. Chris Kimsey quit teaching; quit everything but eating, sleeping and his job in order to dedicate himself to learning Okinawa Shorin Ryu from AL Martin Jr. Sensei. Chris Kimsey called his girlfriend and told her, "I'm going away on a trip and won't be able to see you for a while - about five years. Al Martin Jr., Sensei Immediately began the grueling process of physically training Kimsey, Sensei in the (Old Ways) forgotten about exercises and ancient training methods, and Kimsey, Sensei ate it up like a starving man for over Five years of intense training and continues to train today. Now 2007 almost half a century in the arts later; with thirty years teaching Okinawa Shorin Ryu to Adults and their kids and their Kid’s kids a generation later Chris Kimsey Sensei states he has no regrets. “Most people are like me they earn a Black Belt in a Commercial dojo in Shotokan, Goju, Isshin or other Ryu’s, or one of the Itosu Shorin Ryu Branch systems like Matsumura Seito or Shobayashi maybe even Tae Kwon Do or worst someone’s Modern Mixed Martial Arts crap and they get caught up in themselves, how great they are or how Great their style or Sensei (Teacher) is in reality they have no clue of the realm or scope of real Karate (Okinawa Life preserving Hand) and are to closed minded due to the massive amounts of time and money that they have shelled out, to find out for themselves. Most of these folks start their own Systems or they search out a money hungry Okinawan to be their modern Master of their system in hopes that by doing so it gives them a leg up on their money grubbing competition claiming lineage back to old Okinawa. Someone once said one day real Okinawa Karate would only be found in America what a unique truth!